I learned that class doesn't have to be in a classroom, whatsoever. For Art History with Giovanni Aloi, we are meeting in a different museum/gallery every week for class. This week we are meeting at the National Gallery, next week Tate Britain, then Tate Modern, etc. Cool, huh? Thursday night I also took a long walk down to Soho, alone. With one roommate asleep and the other Clubbin' (more on that later) I was bored so I went out alone for a walk to Chinatown. It was to be an Egg Roll quest, but I just came back and drank a beer and went to bed. I slept late after planning to see the changing of the guard at Buckingham palace. So, missed that, woke up, ate some corn flakes and we were off. We took a couple trains to get to Islington, to find the Tattoo Parlor from London Ink, a show on TLC. After following Alex, in the wrong direction, we stopped looked at the map and then walked back the way we came. We soon found that if we had turned left instead of right we could have been at our destination in 5 minutes. No worries though. We found the shop, took some pictures, got some Ink, and headed back. No we didn't really get a tattoo, Mum. We hopped back on the train after I took a picture of the building which was used for Gringotts bank in the Harry Potter movies. We headed down to Euston Station and to the Wellcome gallery. It was supposed to be a science/educational/modern-contemporary Art gallery. It was all that and more as there were exhibits of everything form ancient masks to medicinal tools used in the 17th century. After that, we left and headed to Buckingham Palace. After wandering around outside the golden gates, we met the queen for tea before heading down the road to see Westminster Abbey. She is really nice in person, but a bit pretentious on the Tele. We arrived at Westminster Abbey, w/o the queen, took some pictures, and fled home in a hurry. After a few awkward conversations and an over priced ale, I walked back here in pursuit of finding the best Fish 'N Chips in London. 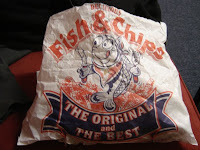 I headed out soon with Alex, on the mission for Fish N Chips to Costa's in Notting Hill. At Costa's I asked the man whether the Haddock or Cod was better, he said Haddock; I went with Haddock. Five minutes later i was walking down Notting Hill Gate burning the roof of my mouth on the freshly fried Chips N' succulent Haddock. Twenty minutes later we arrived back here, I finished as we came in the door and then went to bed. For a first experience with Fish N Chips, I have to say I was impressed.